The first trout plants of the year came to Lake Amador on Friday, October 28th with 1600 pounds of Mt. Lassen Hatchery rainbows arriving at the lake. 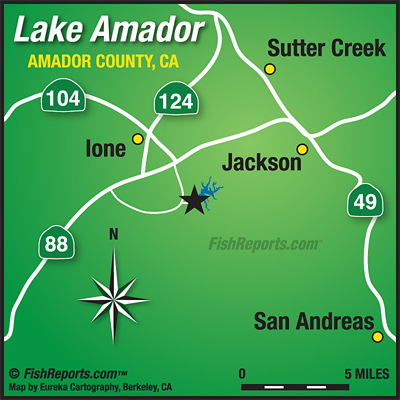 The concessionaires at Lake Amador will be the first in the area to stock rainbow trout as the water temperatures have dropped below 70º at this small impoundment. The plants will continue on a regular basis until the temperatures rise once again close to the end of May 2017. The lake has risen to 22 feet from spilling with inflow from the first storm the season, and the moving water in Jackson Creek and the remaining drainages have cooled the overall lake temperature. This year’s plants will arrive from Mt. Lassen, but the local hatchery may reopen in the future on a smaller scale than in the past to raise the Donaldson trout - a combination of cutthroat and rainbow trout.